New Item! Expected to Ship 05-20-2019. The AH110 is a powerful and flexible 2-way active speaker system with integrated mixer and Digital Media Player. It is recommended for crowds of up to 100. Designed and engineered in Great Britain, the AH110 delivers 400W of peak power and is equipped with a 10″ woofer and a 1″ compression driver for punchy bass and sparkling highs. The AH110’s integrated mixer features an on-board Digital Media Player capable of taking an SD card or a USB memory stick and is fitted with Bluetooth to allow audio streaming from any Bluetooth equipped audio device: Stream your music straight from your phone. The mixer also features two XLR mic inputs, two Jack line level inputs and a Mini Jack input. Bass and Treble EQ controls allow tonal shaping and an XLR Mix Out socket provides connection to additional active speakers (such as another AH110) to expand the system. The cabinet enclosure is made from lightweight, impact-resistant molded plastic making it both portable and road-worthy. Built-in, recessed carrying handles make it a breeze to carry from the car to the venue. The AH110 may also be mounted on a tripod stand via 35 mm pole mount. The Laney Audiohub Venue range of enclosures is designed for high performance in a wide variety of demanding audio applications. 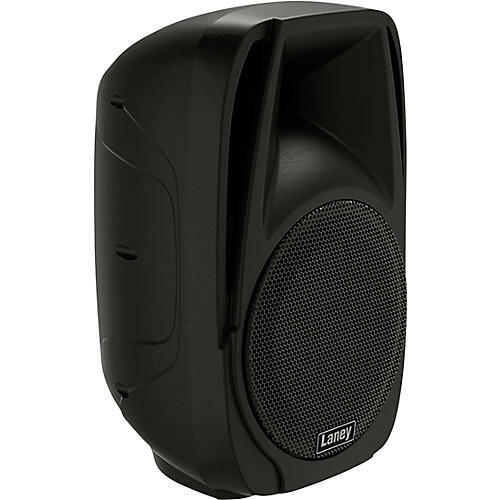 These powered speakers are ideally suited for uses in classrooms, business seminars and presentations, worship meets, parties, bars and musical performances. Housing a flexible onboard mixer which includes a Bluetooth equipped media player, each Audiohub Venue gives you a compact yet flexible solution to your audio sound reinforcement requirements. These lightweight, portable, full range molded enclosures, can be either floor standing or mounted on a pole or tripod stand via the 35mm pole socket. With a focus on producing extremely versatile, high-quality live sound amplification that will stand up to the abuse of professional entertainers, Laney Amplification was founded in 1967 out of an obsession with music and electronics. Laney products provide exceptional value and reliability, all while delivering powerful sound reinforcement with tight bass, clear vocals and crisp highs. If you're looking for maximum performance with minimal investment, look no further than Laney's lineup of active PA systems.